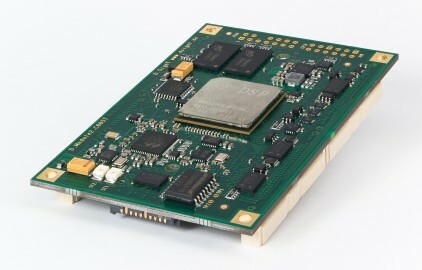 The D.Module2.C6657 is the most recent member of the DSP computer module family from D.SignT, and is based on the Texas Instruments TMS320C6657 Keystone DSP. The D.Module2 provides the next generation of the highly successful D.Module self-stacking design that allows users to build complete signal processing systems by selecting and stacking the appropriate DSP, I/O and data communications modules. The new D.Module2 family was motivated by the continually increasing speed and complexity of DSP systems. Today’s DSPs now include more and more specialised built-in peripherals and communication interfaces. New algorithms and applications are hungry for I/O and memory bandwidth and often require DSP-FPGA co-operation.